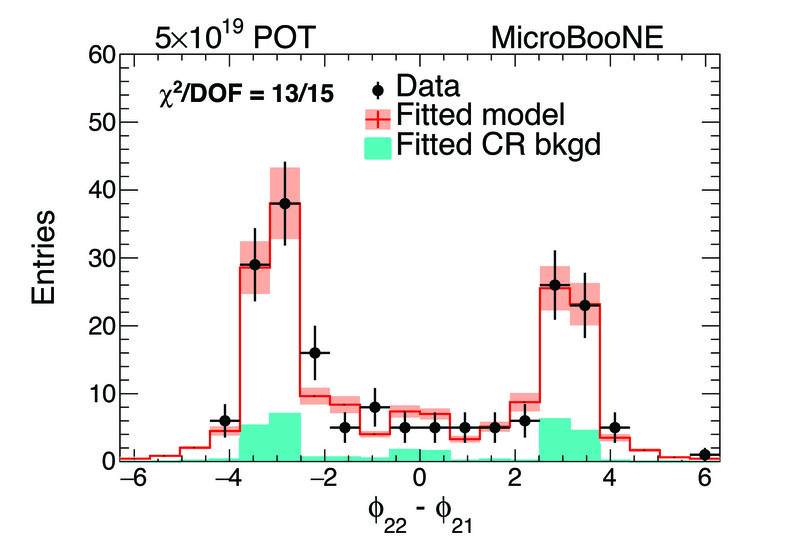 This plot shows the observed multiplicity of charged particles emerging from the neutrino interaction point in MicroBooNE data (points with error bars) and three models (histograms). Data favors lower multiplicity compared to all the models. Neutrinos from the sun, from cosmic rays, from nuclear reactors, from radioactive decays in the earth, from exploded supernovas, from the Big Bang itself, and even occasionally from particle accelerators rush through our body every second in enormous quantity with no notice at all on our part. To detect neutrinos requires that they interact, and to first approximation, the theory of these interactions could not be simpler: They don’t. However, the very occasional scattering of a neutrino could allow us to unlock some of nature’s biggest remaining secrets. To study neutrinos we must enhance their rate of interactions, and this we do by boosting their energies using accelerators such as those at Fermilab and by building massive instrumented targets to give them more chance to bounce off of something. The technology of choice for this at Fermilab is the liquid-argon time projection chamber. This forms the heart of the MicroBooNE experiment’s 170-ton neutrino target, which intercepts the intense neutrino flux generated by Fermilab’s Booster Neutrino Beam. The same technology will in a decade enable the DUNE experiment’s 40,000-ton far detector, sited underground in South Dakota, to receive an even more intense beam generated 1,300 kilometers east at Fermilab. The path to extracting deeper science from neutrinos starts with understanding the details of their interactions, which means not only the manner in which they scatter from protons and neutrons, but also the effects of the argon nuclear volume on this scattering. MicroBooNE’s first neutrino-beam-based physics result, submitted to the journal Physics Review D this spring, launches the experiment’s journey along this path. This plot shows the azimuthal angle difference distribution for events with an observed multiplicity of two for data (points with error bars) and model (histogram). The peaks near positive and negative pi indicate presence of the quasielastic scattering process, while the distribution between the peaks is consistent with predicted contributions from resonance production. The shaded blue area is the estimated cosmic ray background. 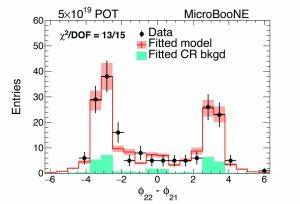 The paper first describes a technique to extract neutrino events from a cosmic ray background-dominated sample using fully automatic reconstruction tools. Then it presents the number of charged particles that emerge from a neutrino interaction point — the charged-particle multiplicity — and compares it against three different versions of the neutrino event generator GENIE. Hints at a discrepancy with model are observed in higher multiplicities, where models predict more events than are observed in data. 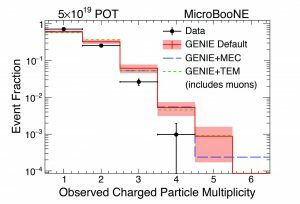 Finally, it compares many charged-particle kinematic distributions from different multiplicities to GENIE models, providing indications of interesting nuclear physics effects on the scattering. 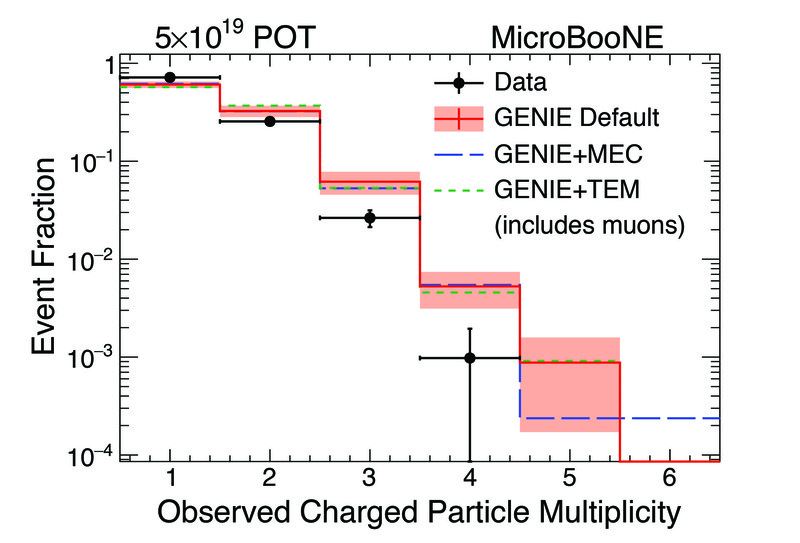 In the end, despite discrepancies here and there, MicroBooNE data agree reasonably well with all three GENIE models. This measurement starts up the MicroBooNE neutrino interactions physics program. It validates the use of GENIE, an important analysis tool, but it also points out areas where models can be improved. In addition to their intrinsic scientific interest, neutrino interaction measurements at MicroBooNE will be very useful for many detectors, such as SBND, ICARUS, and DUNE, that will use the same technology and target. The charged-particle multiplicity paper is now available on the arXiv, and its contents will be described at a wine and cheese seminar at Fermilab on Friday, June 1. Stay tuned for lots of physics to follow! Aleena Rafique recently completed her Ph.D. in physics at Kansas State University. Tim Bolton is a professor at Kansas State University.